The 2:4 maize–double cowpea system consists of a repeating sequence of 4 rows of cowpea alternated with 2 rows of maize. Maize and cowpea are planted on the same day. The second cowpea crop is planted after the first has been harvested (about 60 days after planting).1 The objective of this trial is to gain first-hand experience while evaluating the feasibility of implementing 2-4-2 with other legumes. Jack bean produced the most (4.3 t/ha) dry matter. Cowpea and velvet bean produced 1.8 and 2.8 t/ha dry matter, respectively. Soil fertility and subsequent maize growth were apparently influenced by the amount of leguminous mulch produced and left on the ground. Maize grew taller with jack bean than cowpea, likely an effect of higher biomass with jack bean. 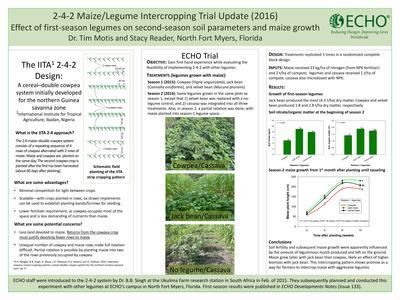 This intercropping pattern shows promise as a way for farmers to intercrop maize with aggressive legumes.